The main parameters of some kinds of biomass feedstock are given here as reference to simple energy balances where they can be utilized. 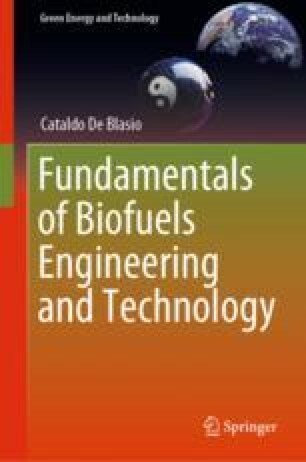 The chapter presents data from diverse sources and starts by giving the properties of biomass in terms of its physical parameters. The evaluation of the calorific values (treated more extensively in the first part of this manuscript) is followed by data on the proximate and ultimate analysis of diverse kinds of biomass. The main parameters required for an overall energy balance are given, and this is followed by proximate and ultimate analysis numbers for different species. In addition, data related to agrofuels are given with the related air requirements for its combustion, and this is followed by combustion properties of peat, minor agrofuels, and related. The section continues with some tables where several data on the parameters, composition, and combustion properties for different types of biomass are given. Notions of stoichiometry are provided at the end of the chapter. (Aristotle, 4th century BC), as cited by Brügemann and Gerds-Ploeger (2013). Bushnell, D. J., Haluzok, C., & Dadkhah-Nikoo, A. (1990). Biomass fuel characterization : Testing and evaluating the combustion characteristics of selected biomass fuels. Final Report May 1, 1988–July, 1989 (No. DOE/BP-1363). Portland, OR (USA): USDOE Bonneville Power Administration; Corvallis, OR (USA): Oregon State Univ. Dept. of Mechanical Engineering. https://doi.org/10.2172/6910422. ECN, The Netherlands. (2018). Phyllis2—Database for biomass and waste (WWW Document). https://www.ecn.nl/phyllis2/. Accessed August 22, 2018. Energy Efficiency & Renewable Energy Department, USA. (2018). Bioenergy Technologies Office|Department of Energy (WWW Document). https://www.energy.gov/eere/bioenergy. Accessed August 22, 2018. Tillman, D. (1978). Wood as an energy resource. New York, USA: Academic Press. https://doi.org/10.1016/B978-0-12-691260-9.X5001-0.